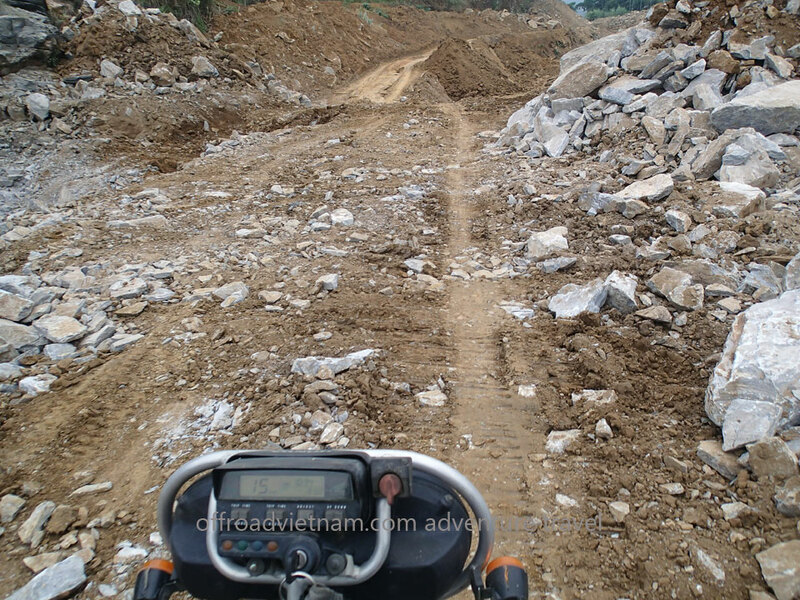 Wild & Bumpy Central North 9 Days Vietnam Motorbiking. 9 days, 8 nights. The video below has some portions of this Central North 9 days Vietnam motorbiking. In case you want to watch more videos of our Vietnam motorbike tours please check our YouTube channel. Today is the first day of this Central North 9 days Vietnam motorbiking. Before starting to ride, we will have a short briefing to let you know about the rules. In addition, the guide will show you how to understand him by his body language. We start around 9.30am after the rush hours. We go from Mai Chau to Moc Chau by the main road. Few kilometres before Moc Chau, we turn right in direction of the Da River. Nice ride until the river. After crossing the reservoir of Da river, we ride on a secondary road until Phu Yen where we spend the evening at our friend’s house. Overnight in the stilt house or in a guest-house. Day 3: Phu Yen – Nghia Lo. ~90 km, ~4 h.
You follow the mountain road, the first part from Phu Yen to Ba Khe via Lung Lo pass is track and the rest is sealed road. Ride through rural areas with beautiful rice fields along the road. Day 4: Nghia Lo – Than Uyen. ~140 km, ~6 h.
In general, the road is wild and bumpy. We go through the Mu Cang Chai massif, almost as high as the Fansipan. From the top, we have one of the most beautiful views of North Vietnam. Day 5: Than Uyen – Bac Ha. ~160 km, ~6 h.
Walk/stroll in the morning. Direction Bac Ha through Sapa. Today is one of the most beautiful riding days of the whole trip. Day 6: Bac Ha – Xin Man. ~50 km, ~4 h.
In general, you ride on secondary roads and tracks. Quiet cruising next to the Chinese border. In fact, this area is mainly populated by Flower H’mong. A short stage that let us time to enjoy this amazing scenery. Reward: A superb hotel of nowhere awaits us in Xin Man. Well deserved rest. Day 7: Xin Man – Luc Yen. ~150 km, ~6 h.
This portion has a long stage but on the easy road. We leave the Chinese border and go toward south until the Thac Ba lake. Day 8: Luc Yen – Vu Linh. ~70 km, ~2 h.
We go round the lake following small tracks. We arrive at Vu Linh, a traditional village of Dzao people where we sleep in the family of our friends. Day 9: Vu Linh – Hanoi. ~180 km, ~6 h.
Dao market in the morning. Then ride back to Hanoi by Son Tay. Very nice road. Contact us now to book this tour or to know about different itineraries and options of this Central North 9 days Vietnam motorbiking.